I’ve been storing my sockets on cheap metal socket rails for, well, forever. Since I bought a roller cabinet and moved the sockets out of their original carry case. The stack of socket rails was really starting to annoy me. I had about ten of them holding various sockets, deep sockets, impact socket, and hex and torx bits. 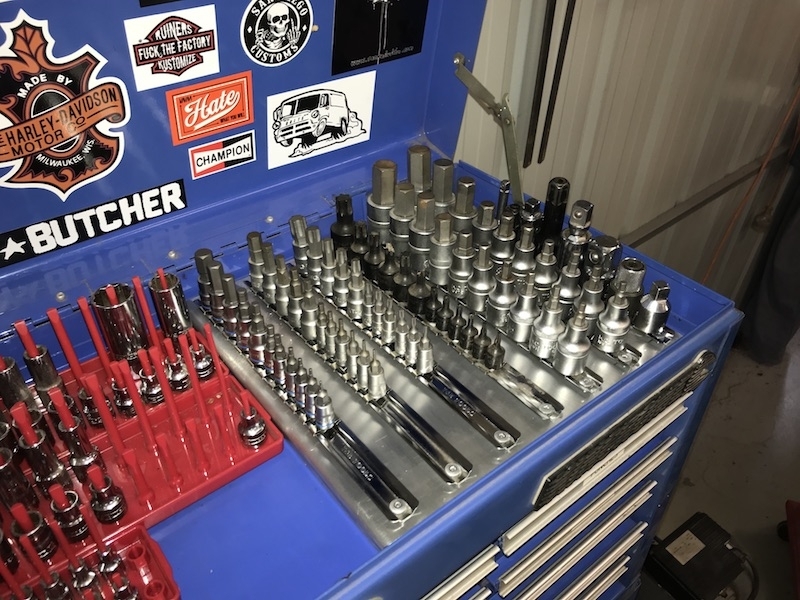 While they are handy (and cheap) to grab to take over to the job, the rails don’t stand up on their own so I’m always rearranging them in my toolbox to keep them neat. On top of that, my 3/4″ drive (yes, the really big ones) were in a separate tool case as there was no room in the current socket storage area. I’ve been searching for a way to best store all my sockets (and use the space as best I can). But nothing really jumped out at me. I was at my local auto parts supplier and they had these plastic storage rails on sale, so I picked up a bunch. They were cheap enough that I’d bin them if this idea really didn’t work. They are similar to these. I bought a couple of larger ones for my 1/2″ drive sockets and put these in a lower drawer (I needed more depth and a larger space to fit them in. I also managed to fit all my 3/4″ drive stuff in this drawer. I might have to make a storage rail for those big sockets in the future. After a bit of head scratching, I saw I had a space in the top of my roller cabinet with the 1/4″ and 3/8″ sockets. I figured I’d just use the existing socket rails and fix them to a “stand”. Of course, I could have just screwed the rails to a piece of plywood, but that would look crap, wouldn’t it? So I figured I’d better make something that looked cooler than that. All the rails conveniently had a drilled hole at one end, so I simply marked off a line parallel to the top edge, and roughly measured the largest sockets to determine the rails should be on 40mm centres. Spacing of the rails is a bit wide for smaller sockets. I could have tightened up the rails for the smaller sockets and possibly fit one more rail on the plate. If you’re going to make something similar, you could space them closer when the sockets on the rails are smaller. There is probably one unintended benefit of the metal socket rails that I realised once I had finished. The rails are all common, and you just have to clip on the size pegs you want (for 1/4″, 3/8″ or 1/2″ drive sockets and accessories). This means it is very easy to rearrange the sockets even if the rails are fixed in place. In hindsight, it would have been feasible to deck out the entire top of my tool box with this set up (rather than the red plastic trays). The upside of the red trays is the ease of taking the set of sockets closer to the job – often I’ll have the set of sockets on the bike lift right under the bike. So you need to pick a solution that fits in with your workflow. The plastic trays I bought are not the best for storage, I think there is a lot of wasted space, but they are very tidy, and they were cheap. This is an improvement to my tool storage, and remember, the tool you don’t use is better than the tool you don’t have! I believe you should enjoy that sense of satisfaction that comes from creating something with your own hands. I believe you don’t have to pay someone else to do it. So now I teach people how to build custom motorcycles by helping them build skills and confidence with my articles and training videos. I provide better technical information for custom motorcycle builders. And I shorten the learning curve getting you there. Rather than having to spend thousands of dollars at a commercial shop, I can teach you to do as much or as little as you want.